How to correctly discount actor critic with experience replay? The learning is becoming less significant as the episode progresses, by means of making $I$ smaller by the discounting factor, as the episode progresses. How would this discounting generalize to experience replay? Meaning, if we want to update $\theta$ and $w$ by some experience e=$(s, a, r, s')$, for which we don't know by how much to discount, how would we accomplish a correct update? Should we remember the discount amount $I$ in the experience? Browse other questions tagged machine-learning reinforcement-learning discount-factor actor-critic or ask your own question. What information should be cached in experience replay for actor-critic? In online one step actor critic, why does the weights update become less significant as the episode progresses? 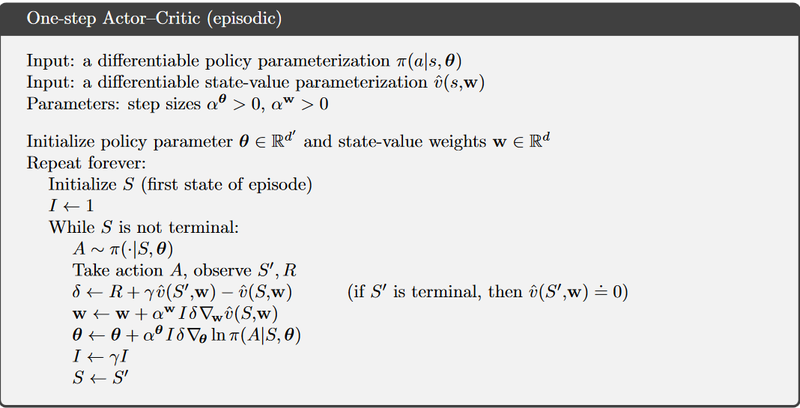 Is the discount not needed in a deterministic environment for Reinforcement Learning? Why does the discount rate in the REINFORCE algorithm appears twice? How many episodes does it take for a vanilla one-step actor-critic agent to master the OpenAI BipedalWalker-v2 problem? How to deal with episode termination in Advantage Actor-Critic algorithm? When are Q values calculated in experince replay? How to make episode ending “good” in reinforcement learning? Does everyone still use discount rates?